Thursday night we made it out dancing after years away from the floor! The dance we all share is Lindy hop which is a dance that was popular in the 30s and 40s, but became popular again in the 90s (“swing dancing”). There’s still a whole international subculture based around it today—but the players and the styles evolve and change. Locally, I used to know or recognize at least a few dancers anytime I went out, and most of the steps. On Thursday I knew only the people I went with and felt like I was faking or creating steps about half the time, but everyone was friendly I and I got to dance my fill. I would like to make dancing a bigger part of my life in 2009…it’s great fun, and is like working out in disguise, which I could use more of. Friday we visited the La Brea tar pits—something that after seven combined years in Los Angeles, I had never actually done. Here’s a picture of the mama mastadon stuck in the tar, while the dad looks on and the baby is like “nooooo!” the baby has his trunk fully extended, but it’s about ten feet too short to save her. It’s really very tragic—like the beginning scene of a Disney movie, except longer and more drawn out. 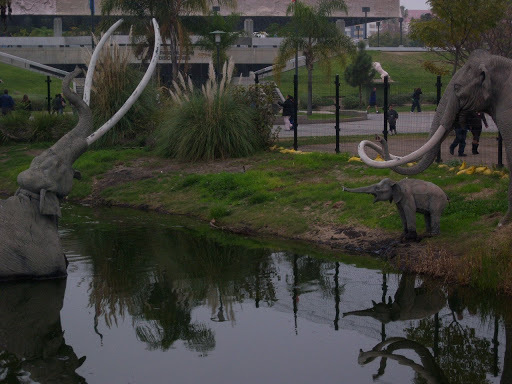 The tar pits are affiliated with the Page museum, which has fossils and such. We decided to bypass this $7 ticket (although we went to the gift shop of course), in favor of the nearby Los Angeles County Museum of Art (LACMA). It has grown over the years and is now a campus of galleries, which made me feel good about buying a year’s membership. We are walking distance to the Museum, and another of my goals for 2009 is just to stop by more often now. I can get in for free whenever I want, so there’s no reason not to just stop in for 15 minutes if I need a writing break, or inspiration. Our group visited just the exhibit at the newly opened Broad Contemporary Art Museum (BCAM), which features works by Warhol, Basquiat, Lichtenstein and the like. 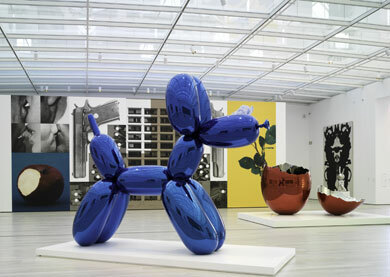 I am a big fan of this large balloon dog by Jeffrey Koons.